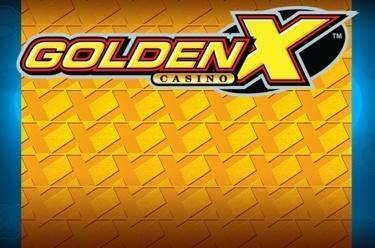 Play Golden X™ Casino online for free now! Are you ready for good fortune on 4 reels? 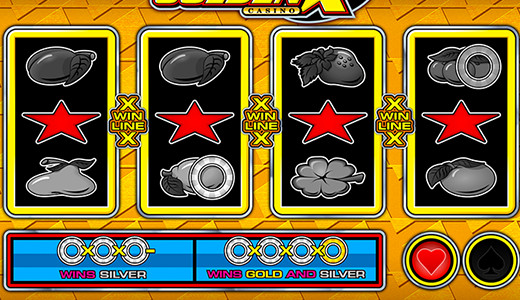 With our cheeky-colourful fruit slot Golden X™ Casino you win without win lines and you can grab more Twists thanks to the silver and golden discs, which appear above some of the symbols! You win as soon as the first 3 or 4 reels show matching symbols from left to right in any position! If 3 silver discs land in any position you win the Silver-Feature. If this shiny 3-symbol combo is supplemented by a golden disc the Gold-Feature is also triggered. Silver-Feature: A disc appears and the silver area is spinning. Click 'Stop' and as soon as the disc has stopped spinning the multiplier with the arrow will be multiplied with your current bet and added to your balance. Gold-Feature: If you landed a golden disc in your regular game the golden area of the disc will also start spinning once the Silver-Feature is finished. Just click 'Stop' to stop the disc spinning and win a multiplier. Off to the slot disco!